Muntinlupa, officially the City of Muntinlupa, (Tagalog: Lungsod ng Muntinlupa), or simply known as Muntinlupa City, is a 1st class highly urbanized city in Metro Manila, Philippines. According to the 2015 census, it has a population of 504,509 people. Classified as a highly urbanized city, it is bordered on the north by Taguig City; to the northwest by Parañaque; by Las Piñas City to the west; to the southwest by Bacoor City and Dasmariñas City; by San Pedro City and Laguna de Bay to the east, the largest lake in the country. It is given the nickname "Emerald City" by the tourism establishment and also known as the "Gateway to Calabarzon" as it is the southernmost city of the National Capital Region. Muntinlupa is known as the location of the national insular penitentiary, the New Bilibid Prison, where the country's most dangerous criminals were incarcerated, as well as the location of Ayala Alabang Village, one of the country's biggest and most expensive residential communities, where many of the wealthy and famous live. There are three plausible origins of the name of the city: First, is its association with the thin topsoil in the area; second, residents, purportedly replying to a question by Spaniards in the 16th century what the name of their place was, said “Monte sa Lupa”—apparently mistaking the question for what card game they were playing; third, the topographical nature of the area, where the term Monte or mountain was expanded to Muntinlupa or mountain land. Based on the 1987 Philippine constitution, it is spelled as Muntinglupa, instead of Muntinlupa. 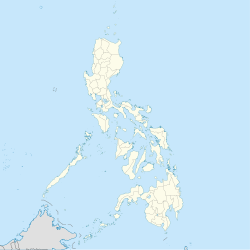 1601: Some 88 years after the arrival of Portuguese navigator Ferdinand Magellan in the Visayas islands, the original lands constituting Muntinlupa could be deduced to have been friar lands administered by the Augustinians, then sold and assigned to the Sanctuary of Guadalupe. 1869: The lands were transferred to the state and large individual landholders. In an effort by the Spanish Government to bring under closer administrative control the people living in the contiguous sitios, as well as those in Alabang, Tunasan, Sucat, and Cupang, the municipality was created upon the recommendation of Don Eduardo de Canizares. August 6, 1898: The town supported the Philippine Revolution against the Spaniards and formally joined the revolutionary government headed by Gen. Emilio Aguinaldo. June 1, 1901: The Philippine Commission promulgated Rizal Province on June 11, 1901 through Act 137. Muntinlupa becomes a district of Morong, Rizal. November 25, 1903: Under the American regime, Muntinlupa was incorporated under Act 1008 and included within the boundary of Laguna province under the municipality of Biñan. Muntinlupa residents protested this Executive Act, and through their town head, Marcelo Fresnedi, filed a formal petition to the Governor for the return of the municipality to the province of Rizal. March 22, 1905: Act 1308 paved the way for Muntinlupa's return to Rizal province to become a part of Taguig along with Pateros. January 1, 1918: Governor General Harrison's Executive Order 108, which grants the petition of residents for an independent status of their municipality, takes effect. Vidal Joaquin, a native of Alabang, served as the first appointed mayor in 1918-1919 followed by Primo Ticman, native of Poblacion 1919-1922 while the first elected mayor was Melencio Espeleta (1922-1924). January 22, 1941: The historic New Bilibid Prison, the national penitentiary, was established in the hills of Muntinlupa. November 7, 1975: Muntinlupa became a part of Metropolitan Manila by virtue of Presidential Decree No. 824 issued by then President Ferdinand E. Marcos. June 13, 1986: Following the EDSA Revolution in February that year, President Corazón C. Aquino appoints Ignacio R. Bunye, Officer-In-Charge of Muntinlupa as part of a nationwide revamp of local government units. In the ratification of the 1987 Constitution, Muntinlupa together with Las Piñas formed one political district. December 6, 1988: President Corazon C. Aquino by Proclamation 351 declares the 19th of December as "Municipality of Muntinlupa Day". February 16, 1995: House Bill No. 14401 converting the Municipality of Muntinlupa into a highly urbanized city was approved by the House of Representatives. Then on March 1, Muntinlupa becomes the 65th city in the Philippines as signed into law by President Fidel V. Ramos, its conversion into a highly urbanized city by virtue of Republic Act No. 7926. Per Section 62 of R.A. 7926 Muntinlupa and Las Piñas were to constitute separate congressional districts, with each district electing its separate representative in the 1998 elections. This separation was additionally confirmed in the city charter of Las Piñas (R.A. 8251) which was approved by plebiscite on 26 March 1997. June 30, 1998: Former mayor Ignacio Bunye elected and sworn as the first congressman representing the city while Manny Villar became the first congressman of Las Piñas. March 1, 2001: Republic Act 9191 declaring the First Day of March of every year as a Special Non-working Holiday in the City of Muntinlupa to be known as "The Muntinlupa City Charter Day" by virtue of Senate Bill No. 2165. August 3, 2007: The city hall of Muntinlupa was completely damaged and later abandoned due to a fire. The fire started from a slum area behind the city hall. Almost all files, important documents and other references of Muntinlupa were burned. It is bordered on the north by Taguig; to the northwest by Parañaque; by Las Piñas to the west; to the southwest by the city of Bacoor in Cavite; by the city of San Pedro, Laguna; and by Laguna de Bay to the east, the largest lake in the country. Muntinlupa’s terrain is relatively flat to sloping towards the east along the lake. Gentle rolling hills occupy the western part of the city, with elevation increasing up to 60 meters and above towards its southwest portion. Alabang is the business district of the city where the tallest structures of the city be located. It used to be the location of Alabang Stock Farm. Land reclamation is also done along the Laguna Lake for further developments in the city. During the dry season, the waterlevel in lake subsides exposing the soil that is then used for farming. The Philippines, due to its geographical location, is one of the Asian countries often affected by typhoons. It is located within the so-called “typhoon belt”. Generally, typhoon season starts from June and ends in November. However, the rest of the months are not entirely free of the typhoons since they are unpredictable in nature and might enter the country anytime of the year. Marikina Valley Fault System' the west segment, known as the West Valley Fault (WVF) is one of the two major fault segments of the Valley Fault System which runs through the cities of Marikina, Pasig and Muntinlupa and moves in a dominantly dextral strike-slip motion. The West Fault is capable of producing large scale earthquakes on its active phases with a magnitude of 7 or higher. Muntinlupa is governed primarily by the city mayor, the vice mayor and the city councilors. The mayor acts as the chief executive of the city while the city councilors act as its legislative body. The vice mayor, besides taking on mayoral responsibilities in case of a temporary vacancy, acts as the presiding officer of the city legislature. The legislative body is composed of 16 regular members (8 per district) and representatives from the barangay and the youth council. The Bureau of Corrections has its headquarters in the New Bilibid Prison Reservation in Muntinlupa. Muntinlupa is the first city in the Philippines to ban the use of plastic bags and Styrofoam for packaging. The City Government encourages to "Bring your own Bag" or "BYOB" when shopping to reduce the use of plastic bags that would otherwise clog the waterways. ISO Certification on Quality Management System or ISO 9001:2000 has initially been acquired on 2004 and is valid for 3 years. Muntinlupa has re-acquired its ISO Certification on QMS in April 2015, ISO 9001:2008, together with Ospital ng Muntinlupa and Pamantasan ng Lungsod ng Muntinlupa as certified by BRS Rim of the World Operations, California. The Philippine Eagle - Symbolizes the City of Muntinlupa soaring into new heights in terms of progress and prosperity; the characteristics properly enlikened to a mother, that is caring, loving and nurturing her children to become good and responsible citizens of the country; and Muntinlupa’s hope, vision and dream of becoming a premiere city of the nation. Bamboo Surrounding the Seal - Symbolizes the ability of the citizens of Muntinlupa to cope up with the fast changing times; that we can withstand the trials that come our way and stand still and ready to triumph again. Lakas, Talino at Buhay - These are words taken from the lyrics of the Muntinlupa March, the city's official anthem. These are values that will guide the city in achieving its goals and visions. 1917 and 1995 - The year 1917 marks the time when Muntinlupa became an independent town while the year 1995 was the time when Muntinlupa became a city. The Philippine Flag - The flag behind the eagle symbolizes the City of Muntinlupa being a part of the Republic of the Philippines and its government. The Nine Stars - The nine (9) stars symbolize the nine barangays that comprises the City of Muntinlupa namely, Tunasan, Poblacion, Putatan and Bayanan for District I and Alabang, Cupang, Buli, Sucat and Ayala Alabang for District II. Muntinlupa is composed of a lone congressional district, and two legislative districts which are further subdivided into nine barangays. Legislative District One includes barangays Bayanan, Putatan, Poblacion and Tunasan in the southern half of the city, while legislative District Two are barangays Alabang, Buli, Ayala Alabang, Cupang and Sucat in the northern portion of the city. Other Zip Codes include Muntinlupa Central Post Office 1770, Ayala Alabang Village 1780, Pleasant Village 1777, Susana Heights 1774, and Filinvest City 1781. The barangays of the city is named after the botanical characteristics, topographical features, and historical events that had been observed in the area when it was named. Tunasan from the plant tunas. Putatan got its name from a tree called putat. Cupang is likewise named after the cupang tree. Buli is named after the buri palm. Alabang is named after the river that passes through the barangay. Ayala Alabang was created by Batas Pambansa Bilang 219 and was originally a part of Barangay Alabang. Sucat got its name from the vernacular word "sukat" which means “measurement” since during the Spanish era was always measured. While Barangays are the administrative divisions of the city, and are legally part of the addresses of establishments and homes, many residents indicate their Subdivision (village) instead of their Barangay. People on from Muntinlupa are referred to as Muntinlupeño as an adaptations from the standard Spanish suffix -(eñ/n)o. The native language of Muntinlupa is Tagalog, but the majority of the residents can understand and speak English. People in Muntinlupa are mainly Roman Catholic. Catholic churches in Muntinlupa are under the control of the Diocese of Parañaque which has about 11 parishes within Muntinlupa. Other religions in Muntinlupa includes various Protestant denominations, Iglesia Ni Cristo, The Church of Jesus Christ of Latter-day Saints, Hinduism, Buddhism and Islam. Barangay Alabang, part of the second district of Muntinlupa, has undergone tremendous growth mainly due to a development boom in the late 1990s. The development of two large-scale commercial real estate projects namely; the Filinvest Corporate City and Ayala Land's Madrigal Business Park, changed the landscape of Muntinlupa from what was once vast fields of cow pasture in the late 1980s, into a supercity that houses new residential, business, industrial and commercial establishments. The Muntinlupa "Business One-Stop-Shop" is recognized in the 2014 World Cities Summit in Singapore in its effectiveness in reducing the number of steps in acquiring a Business Permit. Northgate Cyberzone is the information technology park within Filinvest Corporate City in Alabang. The 18.7 hectare, PEZA registered IT zone is designed, mastered-planned and built around the needs of technology-based companies engaged in Business Process Outsourcing (BPO), Knowledge Process Outsourcing (KPO), education, learning and firm, software design and multimedia, call centers, e-commerce, banking and financial services, as well as other IT support businesses and the like. It is home to Capital One Philippines Support Services Corp., Convergys Philippines Corp, HSBC Electronic Data Processing (Philippines), Inc., Genpact, Verizon Business and many more. Kawasaki Motors Philippines Corporation is in charge of production and distribution of Kawasaki Motors in the Philippines. KMPC, having been in the country for over 40 years, is hailed today as one of the top manufacturers in the Philippine motorcycle industry. Amkor Technology is a semiconductor product packaging and test services provider. Pepsi-Cola Products Philippines has a plant located at Tunasan, Muntinlupa. Zuellig Pharma is within the city. Shopping Centers in Muntinlupa include Alabang Town Center and Ayala Malls South Park owned by Ayala Malls popular for the people for the citizens of Southern Manila, Festival Alabang owned and operated by Filinvest Development Corporationit has an area of 20 hectares, Starmall Alabang (formerly known as Metropolis Star Alabang), and SM Center Muntinlupa owned by SM Prime Holdings. There are multiple car dealerships located in Muntinlupa and most of them are along the Alabang-Zapote Road in Alabang. Ford Motors Alabang has a five-floor facility covering a floor area of nearly 13,000 square meters including a 2-floor, 23-vehicle showroom and a 4-floor, and an 80-bay service center. Toyota Alabang also constructed a facility with a showroom, parts warehouse, office & service facilities in a 5,000 square meter lot. Audi Alabang, Chevrolet Alabang, Chrysler Alabang, Mitsubishi Motors Alabang, Nissan and Suzuki Alabang are also located within the area, most of which are along the Alabang - Zapote Road. Still in Alabang-Zapote Road but located in barangay Ayala Alabang are Hyundai Alabang, Isuzu Alabang and Honda Alabang. The Sucat Thermal Power Plant in 2015. The sole distributor of electricity in Metro Manila is the Manila Electric Company, also known as Meralco. The de-commissioned Sucat Thermal Power Plant is located at Sucat. Water is provided Maynilad Water Services also known as Maynilad is a water and waste water services provider of cities and municipalities of the National Capital Region that forms the West Zone and some parts of Cavite. It is one of the two concessionaires that provide water to Metro Manila in the Philippines, the other one is Manila Water which serves the East Zone. Majority of the land-line connection is provided by phone carrier Philippine Long Distance Telephone Company. Mobile telecommunication services are mostly provided by Globe Telecom, Smart Communications & Sun Cellular. Muntinlupa can be accessed through private vehicles, buses, jeepneys, taxis and tricycles. Electric vehicles by both private and public sectors operate within the borders of the city. Jeepney on the National Road (Daang Maharlika) in Putatan. Jeepneys serve as a main mode of transportation in Muntinlupa. Buses have a stations in Starmall Alabang and South Station Alabang which have routes passing through EDSA to Quezon City, Navotas or Valenzuela. Provincial buses are found in South Station Alabang which have routes to Batangas City, Lucena, Quezon, and even to Bicol Region. Buses also pass through the Alabang viaduct from EDSA to Pacita Station. Jeepneys have stations in Starmall Alabang and South Station Alabang which have routes to General Mariano Alvarez, Calamba and Pasay going through Metro Manila Skyway, Alabang-Zapote Road, or National Road (Maharlika Highway). Tricycles and pedicabs serve the interior of barangays and residential areas. "360 Eco-loop" is Filinvest City’s fully integrated electric-powered public transport system operated by Filinvest as the main mode of transportation around the 244-hectare Filinvest City, Muntinlupa. "electric-Jeepney Ride for Free" is launched by the City Government of Muntinlupa on March 30, 2015 it is composed of an initial fleet of 10 e-jeepneys produced in the Philippines. Philippine National Railways has 3 stations in the city. The following stations are Sucat, Alabang, and Muntinlupa (Brgy. Poblacion) Stations. There used to be a 4th and 5th stations in Brgy. Tunasan and Brgy. Buli, however both were discontinued to be used and demolished in 2009. Alabang station is the terminus of the Metro Commuter services so only the Provincial Commuter services that goes to Calamba City that stops in the Muntinlupa station which is currently 2 Northbound trips in the morning and 2 Southbound trips in the evening. Service southward to Alabang has resumed, but limited to Mamatid station in Mamatid, Cabuyao, Laguna. Muntinlupa is served by expressways, national highways, and arterial roads, usually crowded. National highways serving the city includes Maharlika Highway, which parallels the South Luzon Expressway and functions as the city's main artery and Alabang-Zapote Road, formerly known as "Real Street". Daang Hari Road, opened in 2003, lies on the boundary with Las Piñas near Ayala Alabang, Katarungan Village, and New Bilibid Prisons. Expressways passing through Muntinlupa includes South Luzon Expressway, a part of the Pan-Philippine Highway(AH26) Luzon route, Metro Manila Skyway, an elevated expressway running above the South Luzon Expressway from Makati to Muntinlupa, and the Muntinlupa–Cavite Expressway, 4 km (2.5 mi) long access-controlled toll expressway opened on August 2015. A proposed expressway, Laguna Lakeshore Expressway Dike, is being planned to run along Laguna de Bay from Taguig in Metro Manila to Calamba and Los Baños in Laguna. Arterial roads serve as the main route from the national roads to the barangays and its residential and commercial areas. Few examples of those roads include Commerce Avenue between Alabang and Ayala Alabang, Corporate Avenue in Filinvest City, Alabang, E. Rodriguez Sr. Avenue in Poblacion, E. Rodriguez Jr. Avenue in Tunasan, San Guillermo Street in Putatan, and Manuel L. Quezon Avenue from Alabang to Sucat and to the Taguig city boundary. The arterial roads are usually narrow, crowded with tricycles, pedestrians, and parked vehicles, and has few or no sidewalks, while a few, like Commerce Avenue, are wide divided roads having traffic lights and sidewalks. Schools providing public education in Muntinlupa is administered by Division of City Schools – Muntinlupa, a local division of the Department of Education. Muntinlupa has 89 child development centers (including day care centers, nursery schools and kindergarten schools), 20 public elementary schools, 8 public high schools, 1 public tertiary school, 1 public vocational/technical school, 88 private schools, 10 private tertiary schools and 9 private vocational/technical schools. The "Iskolar ng Bayan" program has been able to give financial assistance to 3,567 students with an allocated budget of thirteen million pesos. The city search for the Ten Muntinlupa Outstanding Students (MOST) is conducted annually to give recognition and honor to talented and academically excellent students in all public and private high schools of Muntinlupa. Muntinlupa National High School is a public high school located at Poblacion, Muntinlupa. MNHS also has a special curriculum, the Science Technology and Engineering or STE (formerly ESEP), that prepares students for careers in Science and Technology, Math, and Communication Arts. Muntinlupa Science High School or MunSci, is a special public high school in the City of Muntinlupa, Philippines that provides a technical and science curriculum that aims to prepare students for careers in Science and Technology, Math, and Communication Arts. Nihongo and French classes are also offered to students. Classes are taught by teachers from the Japanese and French embassies. Pedro E. Diaz High School, formerly Annex of Fort Bonifacio College (FBC), is a public high school located at UP Side Subd., Alabang, Muntinlupa. Muntinlupa Business High School, formerly known as Pedro E. Diaz High School Annex, is located at Espeleta St., Buli, Muntinlupa. The school makes education more accessible to students residing at Barangay Buli, Cupang and Sucat. MBHS offers a curriculum focused on preparing its graduates into vocational and collegiate degree. Tunasan High School, also Known as Muntinlupa National High School-Tunasan Annex is the newest public high school, established in m 2012 which caters Technical Vocational Courses, TVL Maritime and Humanities and Social Sciences under Academic Track and Grades 7-10 of K-12 curriculum. Pamantasan ng Lungsod ng Muntinlupa The establishment of a local university in the municipality started as a dream of former Mayor Ignacio Bunye who viewed education as potent tool for transforming society for the better. Upon his assumption of office in 1986, he included the objective of organizing and establishing an institution of higher learning in the Ten Point Agenda of his administration. Former Dean Enrico Vivar led the movement to convert the Muntinlupa Polytechnic College into a local university. Atty. Raul R. Corro, then Councilor and Chairman of the Committee on Education, sponsored City Ordinance No. 03-089 converting the Muntinlupa Polytechnic College to a Pamantasan ng Lungsod ng Muntinlupa (PLMun) in March, 2003 during the 67th session. The Pamantasan ng Lungsod ng Muntinlupa is now ISO 9001:2008 CERTIFIED by the BRS Rim of the World Operations in California, USA. PLMun was awarded its Certification on April 27, 2015 at the City Hall Quadrangle of the City Government of Muntinlupa. Muntinlupa City Technical Institute MCTI offers technical vocational-training of TESDA Accredited Courses. Courses offered in MCTI are Automotive Servicing NC II, Building Wiring Installation NC II, Dressmaking NC II, Food & Beverage Services NC II and Massage Therapy NC II. ALS Center Bayanan, formerly Bayanan Elementary School Unit I, conducts Alternative Learning System classes during Saturdays and uses modules that students can answer at home. This program will help them finish secondary education to make them eligible to take courses offered by TESDA or be a college graduate. They will be given certificates by the Department of Education (DepEd) once they finish the program in five months. The project is being implemented by the local DepEd office in coordination with the city government. NBP Alternative Learning System is 10-month course offered by the Department of Education (DepEd). Convicts are given a chance to overcome illiteracy or acquire livelihood skills behind bars. This program is made possible by the coordination of Bureau of Corrections with the Department of Education. Muntinlupa has 18 Health Centers, 1 Public Hospital, 8 Private Hospitals. The sole public hospital of the city is the Ospital ng Muntinlupa while the Asian Hospital and Medical Center and the Medical Center Muntinlupa are among the city's private hospital. The Food and Drug Administration, tasked to ensure the health and safety of food and drugs, has its headquarters located at Alabang, Muntinlupa. The Research Institute for Tropical Medicine a research facility dedicated to infectious and tropical diseases in the Philippines is also based in Muntinlupa. Muntinlupa Museum is a five-story structure which is set to contain items of historical value to the city. The exterior is designed to look like a traditional fishtrap. Muntinlupa City Public Library is located at the recently constructed Plaza Central Building at Muntinlupa Poblacion. Plaza Central was inaugurated on October 6, 2017. It is located at the previous site of the Contessa Building (Old City Hall). Muntinlupa has 10 swimming pools, 14 Billiard Halls, 11 Tennis Courts, 8 Resorts, 7 Country Clubs, 9 Dance/Fitness/Slimming Centers, 41 Open Basketball Courts, 59 Covered Basketball Cours and 11 Parks & Playgrounds. The Muntinlupa Sports Complex is used for a variety of activities such as concerts, conferences, reunions and graduations, the sports complex has 3,500 seating capacity and has two separate multipurpose rooms. Located on a reclaimed area in Barangay Tunasan, it has an open area which local residents enjoy their morning exercise and leisure time. Mariz Ricketts - A multi-talented artist. Wife of Ronnie Ricketts. ^ "Philippine Republic Act No. 7926". Chan Robles Virtual Law Library. Retrieved December 11, 2008. ^ "Muntinlupa City". Department of Tourism. Retrieved December 19, 2012. ^ Based on the 1987 constitution of the Republic of the Philippines, it is spelled as Muntinglupa (instead of Muntinlupa). ^ "Muntinlupa's city hall burns down". The Manila Times. Archived from the original on January 6, 2008. Retrieved August 4, 2007. ^ a b "'Big One' Is Possible But Metro Is Unprepared". Quezon City, Philippines: Bulatlat. August 14, 2004. Retrieved February 3, 2010. If a major earthquake were to hit Metro Manila today, the devastation would be so big even disaster response authorities cannot simply cope with it. And it even looks like disaster preparedness occupies a low priority among officials down to the municipal level. ^ "About the Bureau of Corrections Archived October 5, 2009, at the Wayback Machine." Bureau of Corrections. Retrieved on October 2, 2010. "Bureau of Corrections NBP Reservation Muntinlupa City, Philippines." ^ "Editorial: The 19th Cityhood of Muntinlupa". Manila Bulletin. Retrieved March 1, 2014. ^ "MUNTINLUPA CITY: BUSINESS WITH A HEART" (PDF). ^ "First to ban plastics in NCR, Muntinlupa City takes campaign further". InquirerNews. Retrieved December 19, 2012. ^ "Nothing Small in Muntinlupa: "The Model LGU"". ^ "MuntiLGU now ISO 9001-certified". ^ "City of Muntinlupa". PSGC Interactive. Makati City, Philippines: National Statistical Coordination Board. Retrieved June 15, 2013. ^ "Muntinlupa's BOSS system lauded in World Cities Summit in Singapore". ManilaBulletin. Retrieved June 21, 2014. ^ "Cruise around Filinvest City in earth-friendly e-vehicles". GMA News Online. Retrieved November 29, 2014. ^ "Muntinlupa goes green". Manila Times. Retrieved June 29, 2015. ^ "Muntinlupa City taps electric jeepneys for free-ride program". BusinessWorld. Retrieved June 16, 2015. ^ a b c "Highlights of 2014 Accomplishment Report". ^ Dept. of Education Muntinlupa. "School Mission". ^ "HISTORICAL BACKGROUND OF THE PAMANTASAN NG LUNGSOD NG MUNTINLUPA (PLMUN)". ^ "City Resolution No. 99-143 A Resolution Expressing the Desire of The City of Muntinlupa to For the Conversion of Muntinlupa Polytechnic College into a State College" (PDF). ^ "Tech-voc graduates are skilled, job-ready--TESDA". ^ "TESDA Course and School Finder: Muntinlupa City Technical Institute". ^ Rhodina Villanueva. "Muntinlupa supports 100 women scholars". PhilStar. Retrieved August 28, 2008. ^ "Alternative Learning System". DepEd. ^ Jovic Yee. "DepEd chief to Bilibid grads: We're not that different". Inquirer.net. Retrieved March 15, 2015. ^ Sangguniang Bayan ng Muntinlupa (July 21, 1992). "Resolution No. 92-04" (PDF). ^ Sangguniang Panglungsod ng Muntinlupa (November 10, 1999). "Resolution No. 99-147" (PDF). ^ Sangguniang Panglungsod ng Muntinlupa (December 12, 2005). "Resolution No. 05-194" (PDF). ^ Sangguniang Panglungsod ng Muntinlupa (December 7, 2006). "Resolution No. 06-362" (PDF). Wikivoyage has a travel guide for Muntinlupa. Wikimedia Commons has media related to Muntinlupa City. This page was last edited on 22 April 2019, at 23:44 (UTC).